Drill Through provides a way to easily relate data in separate reports within a PDF-formatted document. In Document Composer, you can internally link reports using the Drill Through Destination property. 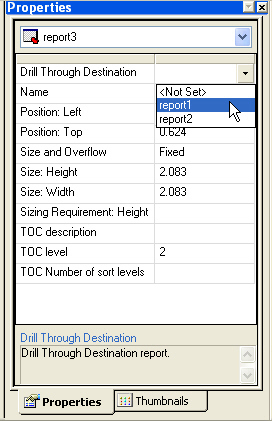 Note: Reports that you wish to set Drill Through Destinations for must be created with Report Painter. Hand coded reports will not work correctly. Create a PDF compound document in Document Composer and place all of the report components on the canvas. Select a report that has DRILLTHROUGH syntax specified. Select the Drill Through Destination drop-down list. The list displays all of the other report component names on the document. Note: If the report that is selected does not have DRILLTHROUGH syntax specified then the Drill Through Destination drop-down list will be deactivated. Select the destination report for the Drill Through. The document must be in PDF format. Drill Through Destinations should only be set once all components are added to the document. When creating a report in Report Painter, only one Drill Through behavior can be specified per report. The field specified to contain a Drill Through behavior must also be present in the target report. Drill Through is only supported for reports, not charts.